If you’ve never been to Firefox Flicks, I recommend you check it out. It’s got some great user-submitted Firefox commercials – some of them are hilarious. 4 of them (Billy’s Browser, This is Hot, Web for All, and Daredevil) are going to air a bit in Boston and San Francisco on cable networks. See the full press release here. 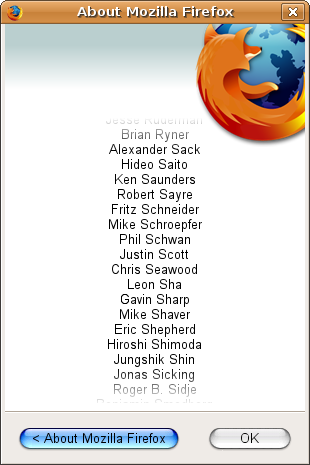 Also, I don’t think I mentioned it before, but my name is in the Firefox 2 credits. It’s over a minute into them, so I took a screenshot for you because you’re impatient. Yes, you. It’s sorta interesting that I actually know who most of the people in that long list are and met many of them at the summit. I have some other stuff to talk about, but I’ll make a different post on that later.